Vaughan Williams was one of the 20th century’s most important symphonic voices. He composed in almost every genre, and even within his nine symphonies he encompassed a wide range of styles, sound-worlds and formal approaches. At its 1935 premiere, the Fourth Symphony surprised many who were more used to the ‘pastoral’ sound of his earlier symphonies. Yet fellow British composer William Walton admired the work greatly, speaking of it as ‘the greatest symphony since Beethoven’. The Eighth Symphony is the shortest of the composer’s symphonies, and much more light-hearted and joyous in mood. At the same time, it too is full of remarkable invention, especially the composer’s experiments in orchestral colour. Vladimir Jurowski (Symphony no.8) has a strong affinity with British music, having embraced (both in concert and on the LPO Label) Britten, Holst and increasingly Vaughan Williams, as well as contemporary British composers such as Mark-Anthony Turnage and Julian Anderson. Ryan Wigglesworth (Symphony no.4) is the leading composer/conductor of his generation. He works with leading orchestras internationally and is currently English National Opera’s Composer in Residence. He has a formidable pedigree with British repertoire, including Birtwistle’s 'The Minotaur' at Covent Garden and Knussen’s 'Higglety Pigglety Pop!' at Aldeburgh, and has already introduced a host of British music, including the Sky Arts Award-winning world premiere of Julian Anderson’s 'The Discovery of Heaven' with the LPO. This performance was released on the LPO label in 2013 with The Crazed Moon and the world premiere recording of Fantasias, conducted by Vladimir Jurowski. The disc was a Gramophone Editor’s Choice and a finalist in their 2014 Awards. Both these Vaughan Williams symphonies were recorded live in concert at the Royal Festival Hall. The Symphony No.4 concert in May 2013 was part of Southbank Centre’s 'The Rest Is Noise' year-long festival of 20th-century music, inspired by Alex Ross’s bestselling book of the same name. Recorded live at Southbank Centre’s Royal Festival Hall, London, on 24 September 2008 (Symphony No.8) and 1 May 2013 (Symphony No.4). 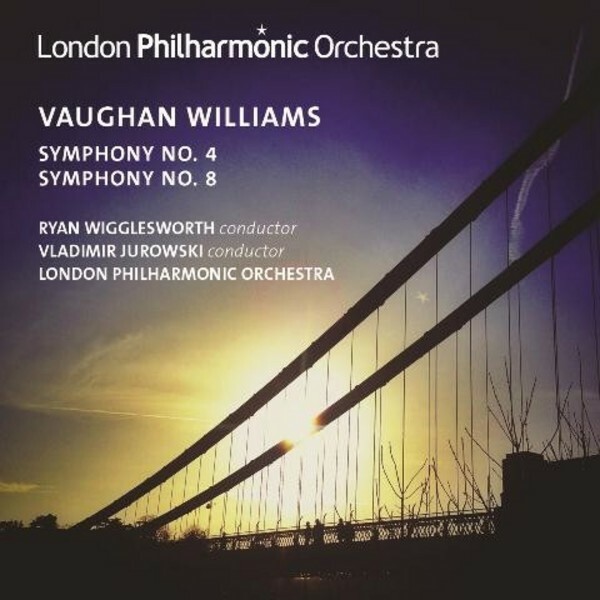 Vaughan Williams' Fourth and Eighth symphonies make for a fascinating coupling on this release from the London Philharmonic's own label. They're the only two of the composer's symphonies to end loudly, and although their characters could in some respects hardly be more contrasting, they can both lay claim to the adjective 'classical', being free of any obvious programmatic elements. In the case of the Fourth (1935), there's a Beethovenian toughness to the motivic elements and their working-out, not least in the transition from the demonic Scherzo to the (initially jubilant) Finale. In the Eighth (1955), the scoring is the most contained of all Vaughan Williams' symphonies, with the exception of an adventurously varied percussion section which lends the work much of its distinctive timbre. That these newly-issued recordings were made almost five years apart and under different conductors, far from being a drawback, seems to highlight these pieces' individual characters, while the LPO, with its distinguished history of performing the composer's music, brings all its collective experience to bear on the performances. Wigglesworth brings a real rhythmic buoyancy to the Scherzo. Some of the scurrying quavers would perhaps be tighter in a studio recording, but this is more than offset by the splendid sense of 'live' momentum. The Trio section is admirably characterful, while the recapitulation of the Scherzo proper and the ominous build-up to the Finale are thrillingly done. In the Finale itself, Wigglesworth captures perfectly the music's ironic edginess, spiky in the Prokofiev manner. Woodwind and horns add plenty of bite, and there's a rhythmic tautness even in the most helter-skelter passages. When the pace momentarily relaxes in the central Lento cantabile, the strings are beautifully poised and expressive, before growling brass presage the reemergence of the main theme. The concluding Epilogo fugato is wonderfully full-throated, yet any hint of false triumphalism is kept rigorously in check, and the last page culminates in a terrifyingly deadening thud. For its sheer naked excitement, Wigglesworth's performance demands to be heard alongside the many competing versions of this work. The very different soundworld of the Eighth Symphony is evident from the outset in a beautifully-captured performance under Vladimir Jurowski from 2008. Jurowski is obviously alive to the music's distinctive colours, with the diverse percussion well-balanced, and the strings singing gloriously from the outset. Woodwind solos are given plenty of room, and there's a rapt, otherworldly quality to the music-making in the opening Fantasia that is completely winning. The wind-only Scherzo is bristlingly alert, with a collective quality of sound that rivals the venerable Eastman Wind Ensemble in its combination of earthiness and virtuosity. In the following Cavatina, the LPO's strings are at their most sublimely soulful, with Jurowski giving them ample space for expressiveness. The closing Toccata, with its exotic array of percussion, makes for an exhilarating close to the disc, rhythms finely sprung and the orchestra clearly at one with Jurowski. This is a marvellously beguiling performance, and it all adds up to a release that should be eagerly snapped up by lovers of this music.